Most scyphozoan jellyfishesincluding most of the large jellyfish with which many people are familiarhave a two part life cycle: free-swimming medusa and bottom-dwelling polyp. 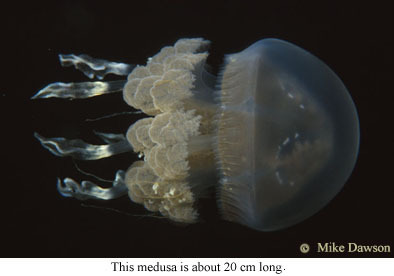 The free-swimming medusa (the part we call "a jellyfish") is either female or male and produces eggs or sperm which combine to produce a larva, called a 'planula' (plural = planulae). The planula swims through the water to find a suitable place to settle, i.e. attach itself to a surface. In the marine lakes, Mastigias planulae settle on the surface (typically the sides or underneath) of rocks, rotting logs, and decaying leaves that accumulate around the lake's side in the poorly oxygenated (but not anoxic) waters at intermediate depths. The planula metamorphoses into a sessile (i.e. fixed-position), usually benthic (i.e. bottom dwelling) polyp called a 'scyphistoma' and it is the scyphistoma, still attached to the surface on which the planula settled, that produces a new free-swimming medusa. 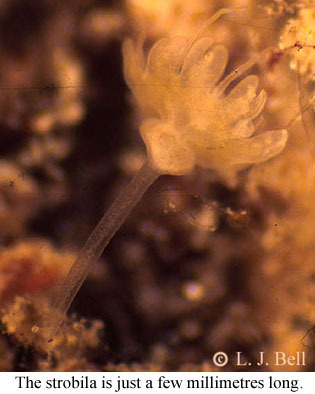 The process by which new medusae are produced is called 'strobilation' and involves metamorphosis of the end of a scyphistoma into an 'ephyra', an immature medusa, that subsequently detaches and swims away. 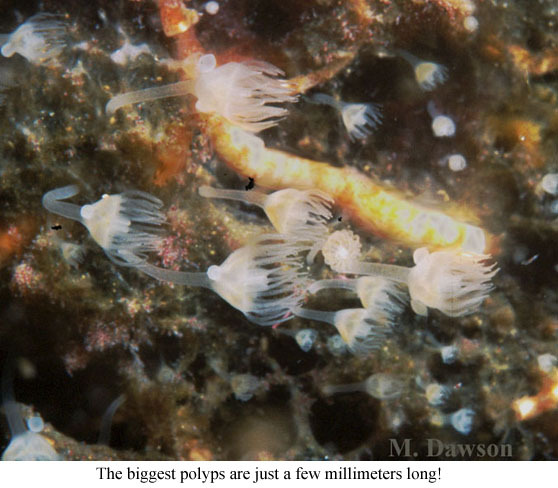 Depending on the species, a single polyp may produce one or many ephyrae all at once, over a period of time, or at different intervals. The ephyra subsequently develops into a mature medusa over a period of weeks to months. 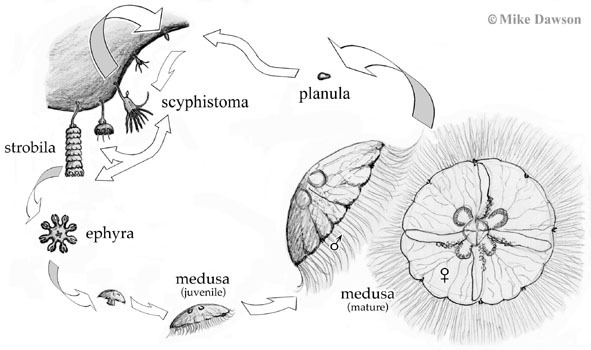 Generalized life cycle of a scyphozoan jellyfish, Aurelia. Click on different life-stages to see pictures from Mastigias!